Learning SUP surfing is much easier and more fun with a patient expert instructor. 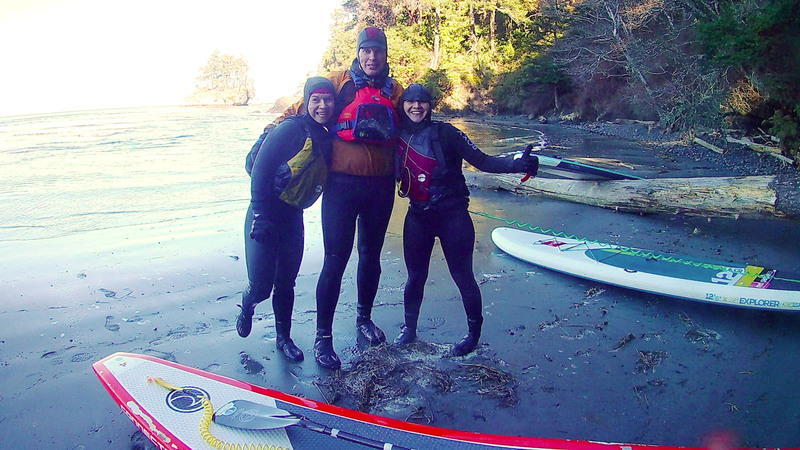 Gain the essential skills to become a confident and safe paddle surfer in the Pacific Northwest. I’ll start you out on small easy waves at one of two scenic coastal locations. You will ride waves your first day. At the end of this class you’ll be able to choose the right gear, launch, paddle out, surf waves, turn, fall safely and be a good SUP ambassador in the surf zone. 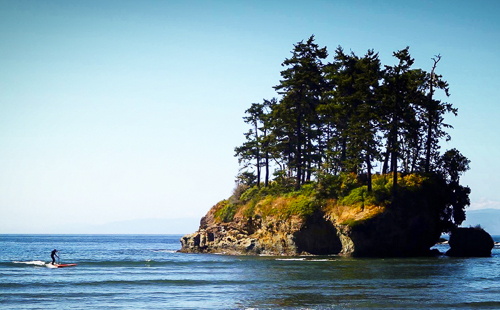 Check out my SUP Surf Camp on August 2-4 at Hobuck Beach on the NW Washington Coast! How to not paddle too hard to catch a wave – Using finesse paddling to save your shoulders. OR completion of our SUP Basics Level 1 or Level 2 classes. You must know how to swim, be in good physical shape to surf and be able to handle paddling in bumps and small waves.You are relaxed standing on a board, know how to paddle straight, have directional control, and can fall off and get back on your board. Below are tentative dates based on preferred tides. We won’t know what the swell direction and size will be until a few days prior of any date. Contact me to discuss your schedule how I determine the surf forecast. Weekdays ok.
Intermediate / Experienced Surfers Note: The above tides are for Crescent Beach but don’t apply for other spots nearby. Contact me for the best dates that work for you and we’ll figure out the best time and place to go per the tides and forecast. Lesson Size: 1 – 3 people. Classes are kept small for safety in the surf zone. Locations: Washington Coast or Strait of Juan de Fuca depending on conditions. You need a stable board to have a fun day. Narrow race boards will be tippy and difficult to manage unless you’re taking this class to train for coastal racing. Unless you have lots of SUP surfing experience, a short 6′-9′ surfing SUP will be too unstable. Required wetsuits: Full surfing wetsuit 4/3 or thicker or drysuit. Try on before you leave. Booties recommended and neoprene hoods Fall-Spring. Group Rate: (Lessons with 2 – 3 people): 225 per person with gear / 199 with your own gear. Private (1-1): 399 with our gear / 373 with your gear. Rental Gear Includes: Stable board, paddle, straight leash, 4/3mm or 5/4mm wetsuit, booties. gloves, hood, optional helmet.